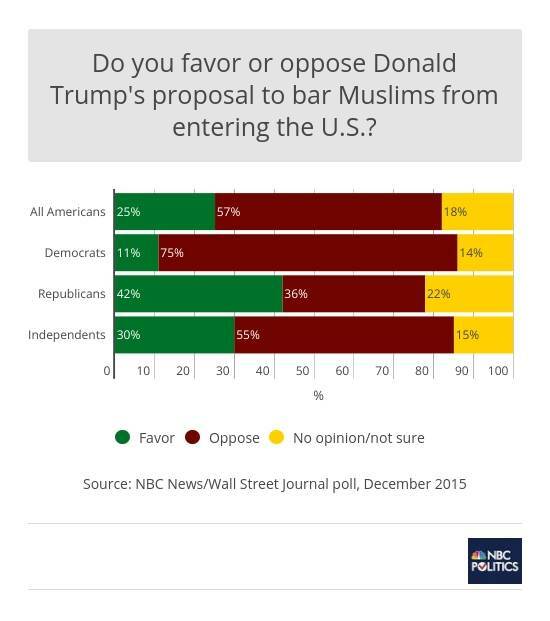 Nearly six-in-10 Americans oppose Republican presidential candidate Donald Trump's proposal to bar Muslims from entering the United States, but Republicans are evenly divided, according to a new national NBC News/Wall Street Journal poll. Fifty-seven percent of all adults disagree with Trump's proposal, versus 25 percent who agree. But views are mixed among Republicans: 42 percent of GOP respondents support Trump's proposal to ban Muslims from entering the U.S., while 36 percent oppose it.
.@Realdonaldtrump has gone from making absurd comments to being downright dangerous with his bombastic rhetoric. Trump's fascist talk drives all minorities from GOP.
.@realDonaldTrump remarks are Idiotic, next thing we will be banning loudmouth, racist billionaires. And among Republican primary voters, it's 38 percent support, 39 percent oppose. By comparison, 75 percent of Democrats and 55 percent of independents disagree with Trump's proposal. There's an urban-rural divide, too: Just 13 percent of urban respondents and 27 percent of suburban respondents back Trump's plan, compared with 41 percent of rural Americans. The NBC/WSJ poll also finds a plurality of Americans - 41 percent - believing that Trump's general campaign statements are frequently insulting and have the wrong approach. By contrast, 24 percent say that Trump's manner and language might be problematic, but think he's raising important issues. And 22 percent say that Trump is telling it like it is and has the right approach. But among Republicans, only 16 percent find him insulting; 37 percent believe he's raising important issues despite his language; and 40 percent say he's telling it like it is. Finally, the poll shows that Americans, by a 2-to-1 margin, have a favorable opinion of Muslims -- 59 percent positive to 29 percent negative - which is relatively stable on a question dating back to 2002. But attitudes among Republicans are more negative: 43 percent hold a favorable view of Muslims, versus 48 percent who hold an unfavorable view. That compared with 75 percent favorable/14 percent unfavorable among Democrats, and 59 percent favorable/25 percent unfavorable among independents. The full NBC/WSJ poll was conducted Dec. 6-9 of 1,000 adults (including nearly 400 reached by cell phone), and it has a margin of error of plus-minus 3.1 percentage points. The question on Trump's Muslim proposal was asked Dec. 8-9 of 495 respondents, which has a margin of error of plus-minus 4.4 percentage points. The rest of the poll will be released Sunday and Monday.